Since 2008, Sweden’s LiveChannel has been working in collaboration with the WCF and its broadcasting arm, World Curling TV, to webcast coverage of World Curling Championship events worldwide. The webstreaming you are viewing now from the World Juniors in Sochi has been produced by a small team of four people, headed by producer and part owner Berth Brandell. “Our motto and goal is to do as close to a TV-like production as possible. We have a tight budget, so we have to find solutions to do it smart. Our people do many things at the same time!” said Brandell. In addition to the production team, Sara Carlsson (Swedish women’s world champion in 2011) and Sander Rølvåg (Norwegian bronze medalist at 2011 world juniors) are commentating all of the action here at the event. They also go through all of the highlights, replays, post-game interviews and more. The professional look and feel of the webcast comes at a cost. Upgrading from standard definition to high definition and the addition of the replay and highlight making equipment cost over one-million Swedish crowns ($157,000 US) for LiveChannel. LiveChannel will be helping World Curling TV to webstream coverage of the upcoming Titlis Glacier Mountain World Women’s Curling Championship in Riga, Latvia; the Ford World Men’s Championship in Victoria, Canada; and the World Mixed Doubles Championship in Fredericton, Canada. The extensive travel can be a lot of work for the small team too. It takes one day to set up equipment and half a day to take it down. Over six hundred kilos of equipment is carefully packed into three hardy and well-travelled road boxes. “We keep track of everything that goes in the boxes when we leave and are responsible for clearing through customs. It’s quite a lot of work,” Brandell said. But despite all of the work for Brandell, he does the job for the love of the game and the people involved. “The curling is the first reason why I love my job and also the team I’m working with. It’s the same people doing it almost everywhere and you get to know them. It’s a great team,” he said. 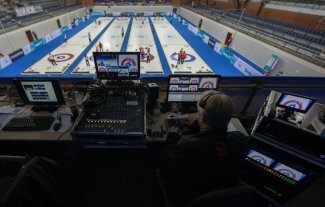 World Curling TV will be broadcasting the remaining Play-off games from the World Junior Curling Championships 2013 in Sochi, Russia. Watch the play-off games on the homepage over the next few days.